With the hugely successful Mario Kart series in coinop, news on hand is Namco will release later this year Mario Kart 3 arcade machines. 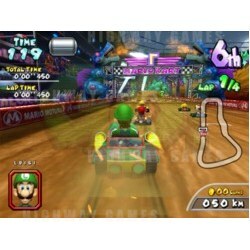 For many operators, Mario Kart has been a consistently strong performer in their venues, which has been reflected in high resale values - especially for Japan made dedicated cabinets. It is unclear whether Namco Japan is planning a worldwide release or dedicated Asian region release. For people not aware, Namco Japan has been steadily introducing their Banapass/NBLine router system with all new games in Asia. For games such as Tekken Tag 2 and Midnight Maximum Tune 4, these games must be connected on Namco's servers to function. All income, game date, venue performance is sent to Namco Japan's servers. Further, Namco Japan earns commission (the rate depends on the game and sell price of the actual machine) from each game play. Namco is now trialing their Banapass/NBLine router system in USA and other regions to check the possibility to run their new system worldwide. This will have huge impact on distribution of Namco products around the world, including the closing of many distributors and limit the amount of used products coming into the marketplace. More news to follow soon.